As a gamer, I rarely play in short chunks. I'd rather play hours at a time. So ever since I learned of Oculus Rift, I've been consumed by one burning question: will playing the Oculus Rift for long stretches make you sick? Well this week I got the chance to test this out on the only willing guinea pig I could find: me. 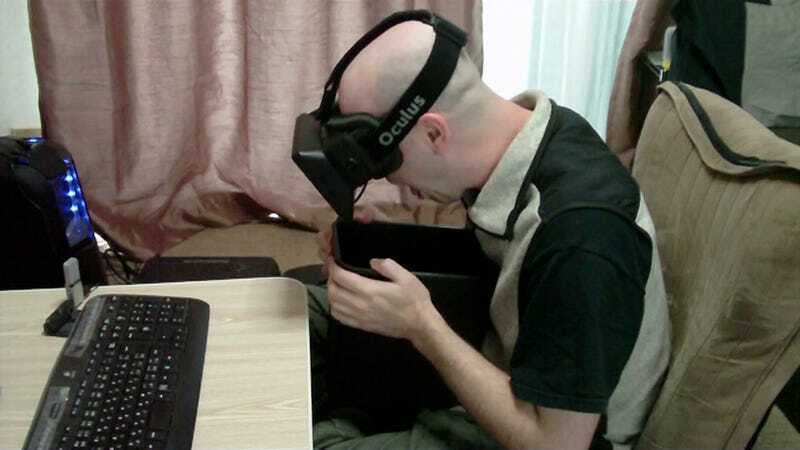 The last time I tried Oculus Rift, I only had a meager hour with the headset, most of which I spent on Portal 2. During that time I experienced no real negative side effects—other than a brief few moments of disorientation upon first putting it on. ...only to be hit with instant nausea. For some odd reason, the game was not configured at all properly. The feeds to the left and right eyes were swapped for starters, and I can't even begin to explain how painful that was to see. After spending a good hour troubleshooting, I got the game running more or less as intended, but was still left with more than one glaring problem. For one thing, the feeds for each eye were subtly different from one another. On one eye there would be a shadow or a reflection not present on the other—it was like having something in my eye that I just couldn't seem to blink away. But the biggest problem was that, while the game itself was properly displayed in 3D, the UI overlay was not. That means that all text windows were doubled (and therefore headache inducing) and menus shared the same problem. However, that wasn't the worst problem with the UI. No, that would be the fact that the crosshair was doubled. I couldn't shoot the broad side of a barn or swing a sword accurately to save my life. I tried playing for the better part of an hour, focusing on the background and ignoring all text pop-ups as I worked my way through escaping the prison. But eventually, I just decided to call it quits. At this point, it wasn't a fair test. Playing Dishonored like this was going to make me sick no matter what. If I wanted a true test of how it feels to play the Rift for long stretches of time, I'd have to play a game that it was designed to work with—not one that worked only thanks to a fan-made driver. So I got up, cleared my head, ate a quick lunch, and decided to go back to an old favorite: Half Life 2: Episode 1. After quickly booting up Team Fortress 2, using its Oculus Rift calibration tool, and transferring those settings over to Half Life 2, I began playing. Barring a short two-minute break to hit the bathroom, down a glass of milk, and refill my water bottle, I played Episode 1 non-stop, from start to finish, over the course of the next five hours. When Alyx jumped into my arms at the start of the game, my hands jerked off my mouse and keyboard as I tried to catch her in real life. It really is that immersive. As I played I found myself occasionally just staring at Alyx's emotional face and looking up or peering down over ledges, just to see the wider view. It's amazing the power the eyes have over your sense of place. At times I literally forgot I was really sitting in my living room. Gamplay wise, Half Life 2 has been tuned in a way unlike either Portal 2 or Dishonored. If you move your mouse around in the middle two-thirds of the screen it doesn’t affect the camera; It just moves your crosshair. Only when the aiming reticle goes into the outer third of the screen does the camera begin to turn. Head movement also allows you to turn the camera—i.e., if you look to your left in the real world, so does Gordon's head. Complicated as this set-up seems, let me tell you, I have never been as good at a FPS as I was playing Half Life 2 on Oculus Rift. Head shots became as easy as a tilt of my head and the click of a mouse. And my improved control wasn't the only reason I was much more accurate. Because the Rift fills up your entire vision, everything is much bigger than when playing on, say, a 42” TV. A head is no longer a small object, but rather a large, easy target. I had no problem slaughtering endless hordes of zombines; they couldn’t even touch me. I really felt like Gordon Freeman. But now that we've looked at all the good I experienced over my five-hour jaunt into Episode 1, it's time to delve into the bad. By the time I hit the one-hour mark in Episode 1, I was queasy and had a minor headache—two afflictions that would remain until after I finished playing. I suspect the queasiness had to do with movement in the game. There is generally a choppiness and blur whenever there is a fast-moving object. And, while, after a few hours I no longer consciously noticed the blur, the queasy feeling never went away and would grow stronger every time I was forced to make repeated, quick spinning movements (though in gunfights I was so immersed that I didn't notice the feeling). The headache, I suspect, came from eye strain issues. The Oculus Rift dev kit I was playing on is one of the original models; so the screen resolution is basically 640x800 per eye. And with the screen so close to your eye, you can easily see every pixel. It really feels like looking at the world through a screen door. The problem is, while you know that it can't get any clearer than it is, your eyes automatically try to bring it into sharper focus—especially if you're focusing on a face or trying to read some text. This gets even worse when you are in a dark room or unlit subway as your eyes are straining to automatically adjust to the dark even though it's impossible. But the most painful thing I experienced came from the loading screens in Episode 1. If you don't remember, the screen in the game will freeze without warning for 10 seconds or so as the next area loads. And in a game where you are constantly adjusting your vision through head movement, suddenly having this control taken away is the most disorientating experience I have had in my life. Just imagine how odd it would be if you turned your head in the real world but your vision remained the same as before. In practice, this feels like being stabbed in the brain at the same time as the world spins out from under you. Another, less painful effect came whenever two objects should have collided but didn't. In the Rift, the gravity gun, for example, is very long. When you spin around holding it, the model often clips through other objects, like a wall for example. This generates a lesser pain like the one mentioned above. Your mind knows that you should stop turning when an object you are holding hits a wall. And when it doesn't, the pain comes in a wave. The oddest side effect I experienced also came from the hit boxes in the game. Basically, the closest I could get to Alyx before running into her hit box was at around two feet away. But as I stopped as if I had hit her physically, my brain interpreted the signal as, “Oh, if you ran into her, you must be super close—and if you are that close, your perception is wrong. She's not far away, she's just tiny!” So for the rest of the game my mind interpreted every human character as being two-thirds the size of a normal human. As I neared the end of Episode 1, I noticed a final side effect: physical pains. While not even a pound in weight, the Rift was starting to take its toll after being perched for nearly six hours upon my head. My neck was more than a little sore and my cheeks hurt where the majority of the Rift's weight had been resting. When I finally beat the game and removed the Rift, I was happy to be done. There were no lasting sensations (spinning, dizziness) and the queasiness and headache slowly dissipated over the next few hours. In the end, I have mixed feelings about the experience. The immersion I felt while playing Episode 1 was an unreal experience and I wouldn't give that up for the world. But the side effects make me worry. When the game was action packed and I was kept busy, I didn't notice the negative side effects much. But when the game slowed down, I would start to focus on just how horrible I was feeling. While I never vomited, my stomach was never happy. In fact, even now, days later when I think about playing the Rift some more, my stomach ties itself in knots. As it stands now, I probably wouldn't want to use it anymore once the novelty of the experience eventually wears off. Thankfully, the Rift as I have experienced it is far from the final product. Newer development kits have better screen resolution and the final product is likely to be better still. Moreover, as more and more games are made specifically to work with the Rift, I am optimistic that a lot of the problems I experienced will become things of the past. The Oculus Rift currently has no public release date for the final product, but development kit models can be ordered at the product's official website.